The vertical mustard-coloured yellow limestone rock displays various perforations throughout its pitted surface, all beneath a large overhang. 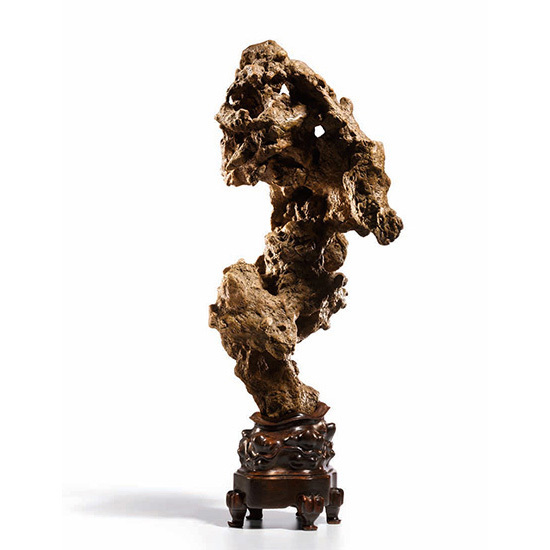 The rock rests on a hongmu Suzhou-type stand. 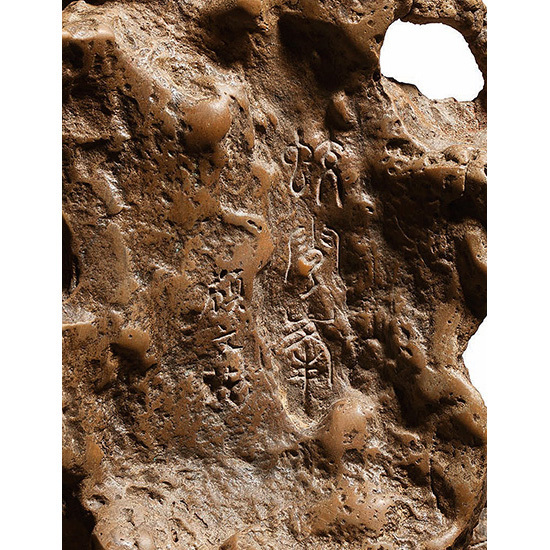 The upper section of one side of the rock has the characters Jiyun Feng 霽雲峰 carved in archaistic script and is signed by Gu Wenbin 顧文彬. 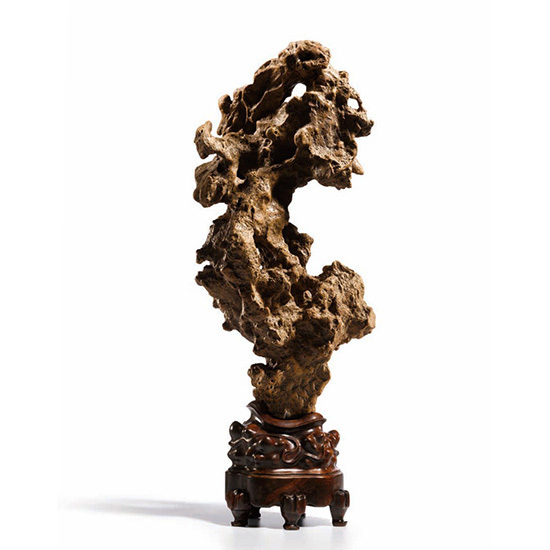 The rock is named Jiyun Feng 霽雲峰 “Cloud Clearing Peak” and signed by Gu Wenbin 顧文彬 (1811-1889), a renowned collector who had one of the finest private collections in China, kept at his “Hall of Passing Clouds” (Guoyun lou 過雲樓) in Suzhou. The collection included numerous rare books, ancient paintings and calligraphy, and a wide range of antiquities; see Gu Wenbin 顧文彬 and Gu Linshi 顧麟士 [Gu’s grandson (1865-1930)], Guoyun lou shuhua ji xuji 過雲樓書 畫記　續集, ed. Gu Rongmu 顧榮木 and Wang Baoji 汪葆楫 (Nanjing: Jiangsu guji chubanshe, 1999), compilations of Gu Wenbin’s Guoyun lou shuhua ji 過雲樓書畫記 and Gu Linshi’s Guoyun lou xu shuhua ji 過雲樓續書畫記. 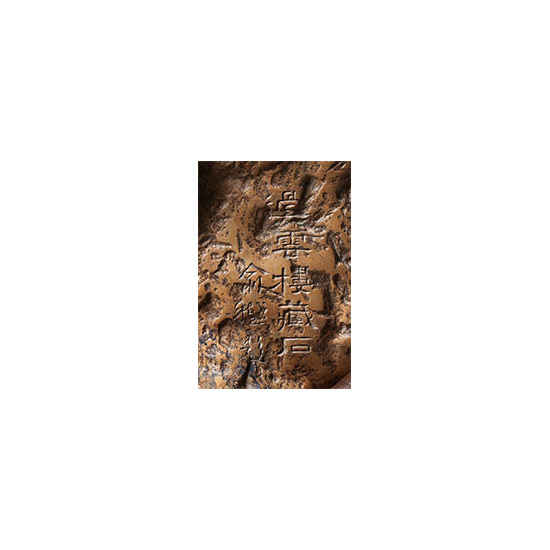 The lower part of the rock has an inscription which reads Guoyun lou shizang 過雲樓藏石 “Rock Kept at the Passing Clouds Pavilion” and signed Yu Yue ti 俞樾題 “Inscribed by Yu Yue”. Yu Yue 俞樾 (1821-1907), a native of Deqing 德清 , Z hejiang, who later moved to Renhe 仁和, now a subdistrict of Hangzhou, was a metropolitan graduate (jinshi 進士) in 1850 and was appointed junior compiler (bianxiu 編修) in the Hanlin Academy 翰林院; he eventually rose to the office of provincial education commissioner (tidu xuezheng 提督學政) of Henan. From 1868 to 1898 Yu was director of the Gujing Jingshe Academy 詁經精舍(The Refined Lodge of the Exegesis of the Classics), near Mount Gu 孤山 at Hangzhou, founded by Ruan Yuan 阮元 (1764-1849), one of the most influential private academies during the late Qing. Yu was also an expert in philology and textual studies,who taught and wrote prolifically on the classics and histories; he also wrote important works on the Zhuangzi 莊子 (Sayings of Master Zhuang). His collected writings were published as the Chunzai tang quanji 春在堂全書 (Complete Works from the Hall where Springtime Resides).